Like many trends, classic arcade games have been coming back into style lately. While many arcades have closed down over the past few years, more modern establishments are popping up, like barcades. A barcade, or bar arcade, is basically an arcade for adults. While the newer generation is more into console or PC gaming, those in their late 20’s and 30’s are going back to classic gaming methods. Royce’s Arcade Warehouse has been offering retro arcade experiences since 2013. Roughly around when they started opening the arcade for Freeplay Saturdays, we started assisting them with digitally printed arcade headers, control panels, and more. They also offer warehouse parties and service calls. While we have helped them out with classic games like Mortal Kombat and Street Fighter, one job, in particular, was a little more interesting. 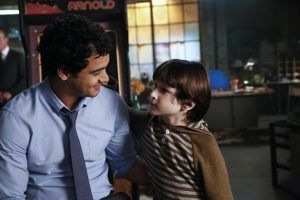 Scorpion is an American action drama TV series that is currently running on CBS. 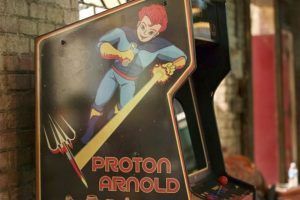 In season one, the team purchases an old arcade cabinet game for Proton Arnold, which is a made up video game that exists in the series. The cabinet used in the show is actually from our long-time customer Royce’s Arcade, and we were asked to make prints for the control panel, the image on both sides of the cabinet, and the marquee, which is the lightbox at the top of the cabinet that displays the name of the game. Proton Arnold is meant to be an arcade game that the adult characters played when they were younger so the graphics have a very retro feel to them. Both sides of the cabinet are identical and cover the whole side. We digitally printed the graphic they provided onto vinyl. Using our wide format printer, we were able to just print the whole image as one piece for easy installation. The images on the control panel were also printed onto vinyl. You can’t see it too well in the photo, however, the whole surface is a digital print with labels for the different players, how to move, and which buttons to press to use special powers like “force field” and “fire”. Lastly, the image for the marquee was printed directly onto menu board material. Menu board material is translucent so as you can see from the photo, the name “Proton Arnold” is displayed brightly. Most arcades are dim lit so a lot of arcade cabinets will have something that illuminates to display the name of the game so it is easy to find. The prints look great, and we are excited to continue to see the game featured on future episodes of the show.